As a follow on from my previous blog post, where we looked at the different use cases for using Kerberos in SAS Viya 3.3, in this post will delve into more details on the requirements for use case 4, where we use Kerberos authentication through-out both the SAS 9.4 and SAS Viya 3.3 environments. We won’t cover the configuration of this setup as that is a topic too broad for a single blog post. Here the SAS 9.4 Workspace Server is launched with Kerberos credentials, the Service Principal for the SAS 9.4 Object Spawner will need to be trusted for delegation. This means that a Kerberos credential for the end-user is available to the SAS 9.4 Workspace Server. The SAS 9.4 Workspace Server can use this end-user Kerberos credential to request a Service Ticket for the connection to SAS Cloud Analytic Services. While SAS Cloud Analytic Services is provided with a Kerberos keytab and principal it can use to validate this Service Ticket. Validating the Service Ticket authenticates the SAS 9.4 end-user to SAS Cloud Analytic Services. The principal for SAS Cloud Analytic Services must also be trusted for delegation. We need the SAS Cloud Analytic Services session to have access to the Kerberos credentials of the SAS 9.4 end-user. These Kerberos credentials made available to the SAS Cloud Analytic Services are used for two purposes. First, they are used to make a Kerberized connection to the SAS Viya Logon Manager, this is to obtain the SAS Viya internal OAuth token. As a result, the SAS Viya Logon Manager must be configured to accept Kerberos connections. Secondly, the Kerberos credentials of the SAS 9.4 end-user are used to connect to the Secure Hadoop environment. In this case, since all the various principals are trusted for delegation, our SAS 9.4 end-user can perform multiple authentication hops using Kerberos with each component. This means that through the use of Kerberos authentication the SAS 9.4 end-user is authenticated into SAS Cloud Analytic Services and out to the Secure Hadoop environment. To start with, why would we look to use this use case? 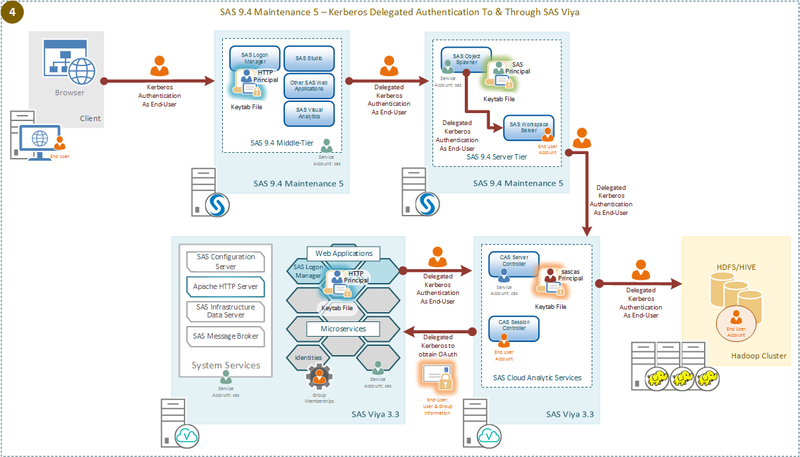 From all the use cases we considered in the previous blog post this provides the strongest authentication between SAS 9.4 Maintenance 5 and SAS Viya 3.3. At no point do we have a username/password combination passing between the SAS 9.4 environment and the SAS Viya 3.3. In fact, the only credential set (username/password) sent over the network in the whole environment is the credential set used by the Identities microservice to fetch user and group information for SAS Viya 3.3. Something we could also eliminate if the LDAP provider supported anonymous binds for fetching user details. Also, this use case provides true single sign-on from SAS 9.4 Maintenance 5 to SAS Viya 3.3 and all the way out to the Secured Hadoop environment. Each operating system run-time process will be launched as the end-user and no cached or stored username/password combination is required. At a high-level, we need to have both sides configured for Kerberos delegated authentication. This means both the SAS 9.4 Maintenance 5 and the SAS Viya 3.3 environments must be configured for Kerberos authentication. Where the <HOSTNAME> part should be the fully qualified hostname of the machines where the component is running. This means that some of these might be combined, for example if the SAS 9.4 Metadata Tier and Compute Tier are running on the same host we will only have one SPN for both. Conversely, we might require more SPNs, if for example, we are running a SAS 9.4 Metadata Cluster. The SPN needs to be registered against something. Since our aim is to support single sign-on from the end-user’s desktop we’ll probably be registering the SPNs in Active Directory. In Active Directory we can register against either a user or computer object. For both the SAS 9.4 Metadata and Compute Tier the registration can be performed automatically if the processes run as the local system account on a Microsoft Windows host and will be against the computer object. Otherwise, and for the other tiers and components, the SPN must be registered manually. We recommend, that while you can register multiple SPNs against a single object, that you register each SPN against a separate object. Since the entire aim of this configuration is to delegate the Kerberos authentication from one tier/component onto the next we need to ensure the objects, namely users or computer objects, are trusted for delegation. The SAS 9.4 Middle-Tier will only support un-constrained delegation, whereas the other tiers and components support Microsoft’s constrained delegation. If you choose to go down the path of constrained delegation you need to specify each and every Kerberos service the object is trusted to delegate authentication to. Finally, we need to provide a Kerberos keytab for the majority of the tiers/components. The Kerberos keytab will contain the long-term keys for the object the SPN is registered against. The only exceptions being the SAS 9.4 Metadata and Compute Tiers if these are running on Windows hosts. You can now enable Kerberos delegation across the SAS Platform, using a single strong authentication mechanism across that single platform. As always with configuring Kerberos authentication the prerequisites, in terms of Service Principal Names, service accounts, delegation settings, and keytabs are important for success. 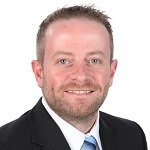 Stuart Rogers is a Architecture and Security Lead in the Global Enablement and Learning (GEL) Team within SAS R&D's Global Technical Enablement Division. His areas of focus include the SAS Middle Tier and security authentication.